I know we always stress about eating healthy and eating well, but when you hear chocolate and more chocolate from Girl Scouts Thin Mints, our heads turned a bit. It’s ok to indulge every once in awhile right? Did anyone else see these today? 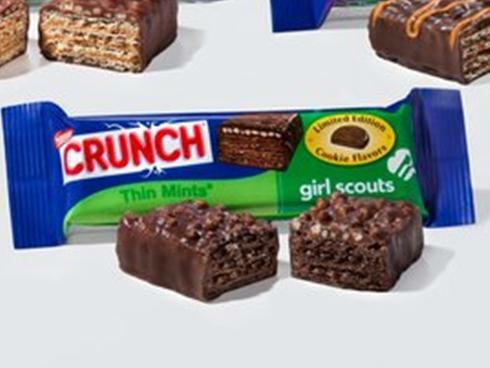 Nestle crunch is the first chocolate company to partner with the Girls Scouts Cookie. Memorial Day is this coming weekend, which also means we should be welcoming warmer weather soon. What better way but to find interesting ways to have our alcohol. But before you go bucking it, let us say that from sip to lick the frozen Mojito can confidently double down over its fluid counterpart and take you from cool to sublime faster than you can say freeze! Now that you know we’ve got our Teflon suits on, give it your best lick and let us know what you think. 1. Place chopped watermelon in a food processor or blender and process until watermelon is juiced (will be slightly pulpy). 2. Combine watermelon juice, lime juice, mint syrup and rum in a shaker and shake well. Fill popsicle mold 3/4 of the way up with mixture. Fill remaining popsicle mold with club soda and stir to combine. 3. Freeze for about 2 hours or until mixture starts to solidify enough to hold a popsicle stick upright. 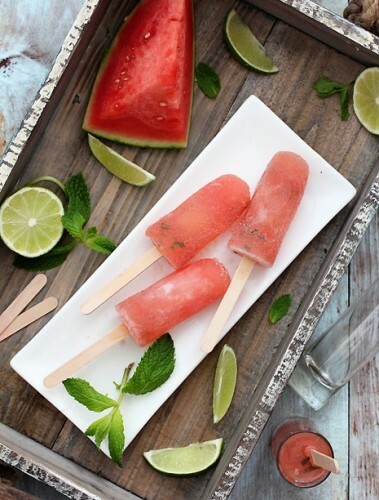 Insert popsicle sticks and finish freezing popsicles overnight. To release popsicles run hot water on the outside of popsicle molds for a 2-3 seconds. 1. Place sugar and water in a pot over heat until sugar dissolves. Allow mixture to cool to room temperature and place mint leaves in mixture and muddle. Allow mint leaves to steep for 20 minutes. Strain and discard leaves. (Depending on the fine-ness of the sieve tiny pieces may remain). Job growth, schmob growth — these are still lean times for us all. But that doesn’t mean we can’t stretch our few precious dollars into a scrumptious spread. 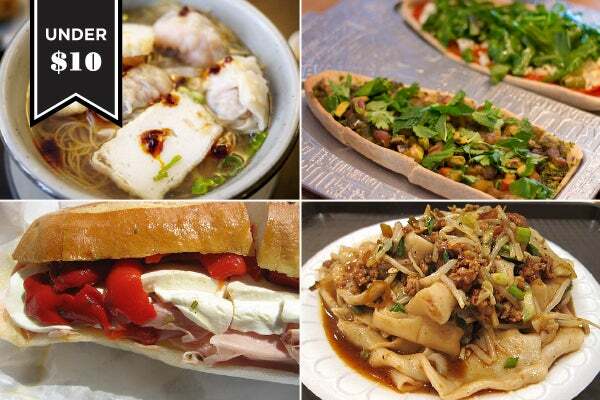 Behold our guide to a few of our favorite cheap eats in the city — some classic standbys, some new faces on the block. “Cheap,” of course, is relative to what we’re willing or able to spend. Ten bucks for a burger might seem extreme, but not when it’s ground with some of the best Kobe beef in the city. So, we’ve given you prices from dirt-cheap to savvy semi-splurges, and, since you can’t exactly host a business lunch at the bodega’s deli counter, even rounded up some of the best prix fixe bargains from the city’s hottest restaurants. We promise, it’s better than eating ramen noodles in your boxers. Five bucks barely buys anything anymore, especially a decent lunch, and okay, so maybe these are $5.25 and under, but it’s pretty close. You could spend your beloved Lincoln on a deli buffet, or you could get sneeze-guard-free fare at these choice spots, starting at just $1. Both Serious Eats and the New York Post have called Percy’s the best dollar slice in the city, and with real-deal Italians putting out pies you’d pay five times more for, we don’t argue that. Percy’s Pizza, 190 Bleecker Street (between Avenue of the Americas and Downing Street); no website. Falafel feels like it’s cheating, because it’s right up there with other fried goodies, but it’s vegan — and good for you, and completely satisfying. It confuses us. But Maoz makes it easy, stuffing its pita pockets with crazy-fresh veggies and some of the finest falafel this side of Nile. This salt-and-carb-fueled snack that shouldn’t but easily can step in for lunch. Sure, you could always grab a stale old twist of dough from a street cart, but Sigmund’s tops theirs with feta and olive or truffled cheddar. Hard decision. Sigmund’s Pretzels, 29 Avenue B (between Eassigmundnyc.com‎t 2nd and East 3rd streets); 646-40-0333. Pillowy bread with just the right kind of crumb, the classic combination of ham and pate — Banh Mi Saigon was one of the first shops to bring the famous sandwich to our fair city. And, we imagine, it tastes just as perfect now as it did last century. Banh Mi Saigon, 198 Grand Street (between Mulberry and Mott Streets); 212-941-1541. This is our usual neighborhood, spending-wise, but with about a zillion restaurants on every avenue, we often face the tyranny of choice. But it’s time to fight tyranny with a revolution — of noodles, to start. Another Xi’an plate for bigger bellies, the ripped noodles — made right in front of you — are all amazing, but we’re partial to the unctuous scraps of sauced pork that layer this pile of handcrafted, starchy goodness. We’re giving you a range on this sandwich price because there’s no menu to speak of at this Little Italy institution. Just follow the lead of the legions of sammich-hungry habitués, and expect a legendary sandwich that will last for several meals. Hipster philosopher-hotelier Cyril Aouizerate’s strange new spot is far too complex to explain here, except to say that it’s vegan and backed by some pretty famous chefs. 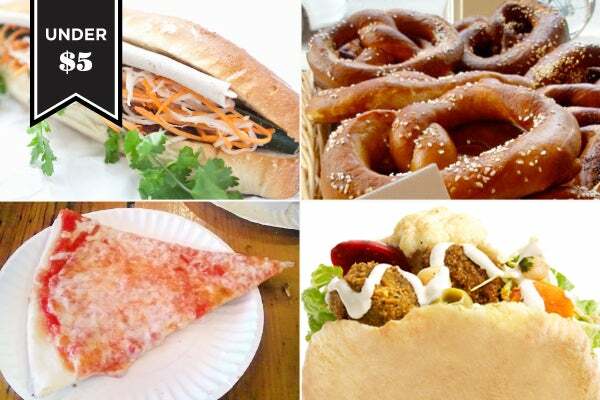 The signature MOBs — shaped like the arches of the Brooklyn Bridge — are full of eggplant tagine, a vegan-take on Margherita pizza, and more. Maimonide of Brooklyn, 525 Atlantic Avenue (between 3rd and 4th avenues); 718-797-2555. Between the dozens of bowls of scrumptious, steaming noodle soup that the Village puts out every day is the subtle dance of the Duet: a fishy broth surrounding a mop of egg noodles, which hold shrimpy dumplings and lick-your-lips crispy fish skin. Noodle Village, 13 Mott Street (between Worth and Mosco streets); 212-233-0788; no website. The Torrisi Italian Specialties spinoff is still packed every day since opening late last year, so expect a wait for this pile of house-roasted turkey stuffed into a classic hero. It might sound like your average deli fare, but it is not, dear reader. It is not. Served on a puffy English-muffin-style bun is a half-pound of the most beautiful Japanese Wagyu beef that will last you not only through lunch and dinner, but probably the next day. Zaitzeff, 711 2nd Avenue (between East 38th and East 39th streets); 212-867-3471. These Jewish Quebecois expats know their smoked meats. And while the small Brooklyn shop has expanded with bagels and a whole dinner menu, their take on the holy trinity of brisket, mustard, and rye still makes devout pastrami pilgrims weep. Mile End Delicatessen, 97 Hoyt Street (between Atlantic Avenue and Pacific Street); 718-852-7510. You might blanch at the price at first, but Luke’s is one the best lobster roll bargains in town. It helps that the sea bug is shipped straight from Maine, spending its final earthly moments on a buttery New England-style roll. 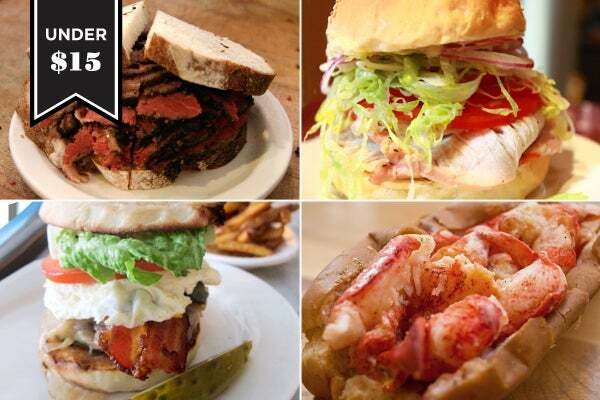 Luke’s Lobster, 93 E 7th Street (between 1st Avenue and Avenue A); 212-387-8487. How much is too much to spend on a cocktail? These days many New Yorkers think nothing of spending upwards of $15 on a drink (an average cost), but that price is slowly creeping up and it seems like the days of $20 cocktails aren’t that far off. A number of places have already crossed that threshold – and then some. But are more expensive drinks worth the dough? The Drink: The house margarita is given the royal treatment with El Tesoro Paradiso tequila (you can also choose Patron Platinum or Casa Noble Extra Añejo) and for an extra dollar Serrano tincture is added to the rim. 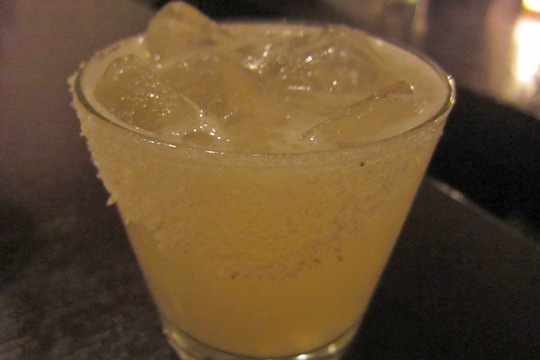 The upscale tequila gives the drink a smoky flavor and the Serrano tincture gives it a spicy, lip-burning kick. Why the Price? As most of the other margaritas were in the normal price range, the elite tequila is 100% responsible for the elite cost. Is It Worth It? Not a chance. Yes, our margarita was smoother and more intensely flavored than our poor friend’s pedestrian house marg, but for $29 we wanted this to be the best margarita of our life and it just wasn’t (we honestly didn’t even finish it). The Serrano tincture, on the other hand, was way worth the dollar price tag; we wish all margaritas came with that option. We will go back for the tacos, however. The Drink: Once the most expensive cocktail in the world, this appropriately gold-hued drink is made with a laundry list of luxe ingredients: Remy XO (cognac), Pineau des Charentes (French aperitif), freshly squeezed grape and lemon juice, dash of bitters and topped with Veuve Clicquot (champagne) and – the piece de resistance – 23-carat edible liquid gold (crazytown). The individual ingredients are poured into glasses behind the bar and then all brought out on a silver platter so the bartender can craft it right before your very eyes. We were prepared to hate it, but it pains us to say its light, fruity flavors created a party, no, a symphony in our mouth. It didn’t hurt that Kenneth McClure, originator of the drink (and GM at Hospitality Holdings which owns the bar), happened to be there and it was he who made our drink. Why the Price? To all of the above, add in that the bar is located in Trump World Tower. Is It Worth It? If you are Donald Trump or Derek Jeter, yes. Being neither, we found ourselves conflicted. On one hand fifty dollars for a cocktail is sheer insanity, like thousand dollar handbags, $450 tasting menus and Angelina Jolie’s right leg. The Drink: According to King Cole Bar lore, in 1934 a bartender literally spiced up a vodka and tomato-based cocktail and thus the Bloody Mary (renamed the Red Snapper to better befit its elegant setting) was born. It remains the bar’s signature drink today. 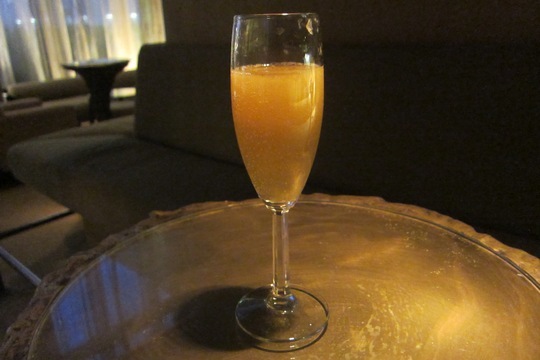 And while it isn’t the bar’s most expensive cocktail, given its basic ingredients, it merited inclusion on the list. Why the Price? The history? The fancy schmancy setting? The old-school bartenders? It has to be one (or all) of those two things because nothing in the drink – Belvedere vodka, tomato juice, lemon juice, salt, black pepper, cayenne pepper Worcestershire sauce – costs that much. That said, the trio of bar snacks were stellar and the posh place did feel steeped in history. Is It Worth It? 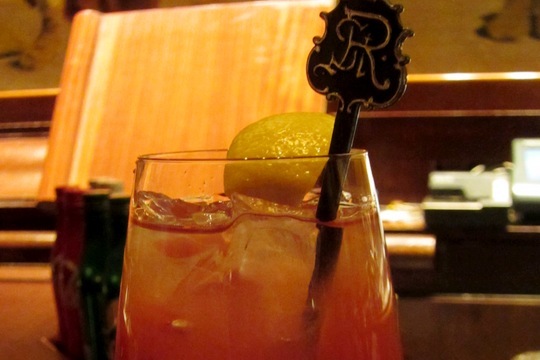 If you’re positively obsessed with Bloody Marys and think your life won’t be complete without trying the famed drink at its possible birthplace (and you like feeling classy), then we suppose so. If we’re going purely on taste, then no; it didn’t have the depth of flavor, kick and gritty texture (from ingredients like fresh horseradish) we like in our Bloody Marys. The Drink: Found at an Upper East Side cigar bar, this cocktail, the most expensive one on our list, is made with Chateau Fontpinot (a rare aged Cognac made from Champagne grapes), Belle de Brille (pear-flavored Cognac liqueur), Real Campanhia (aged port) and pear nectar, and inexplicably garnished with a maraschino cherry. You could definitely taste the pear and overall it was surprisingly sweet with a complex finish. Why the Price? OK, yes, the ingredients are expensive, we get it, but come on. Every other available cocktail is $18, so this one has gimmick written all over it. Is It Worth It? In the immortal words of Whitney Houston, “hell to the no”. First of all, you are in an aging cigar bar, so for lack of a better word, the place stinks, and while the drink had fine flavors, there was nothing particularly special or memorable about it. For $63 you should at least be able to take home the glass, Planet Hollywood style. We can’t think of any reason anyone on earth would ever order this drink or why it was created, unless its sole purpose is to give wealthy men a bargaining chip when trying to persuade their trophy wives to accompany them to an old club to smoke cigars. 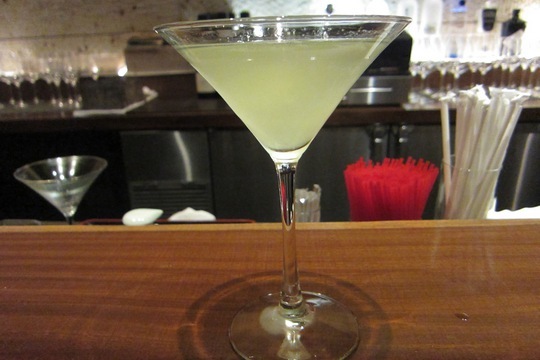 The Drink: Made with jalapeno vodka, fresh lime and muddled cucumber, this drink knocked our socks off. The taste and depth of flavor was startling, like a pleasant punch in the face. You’d first get hit with the heat of the vodka before the refreshing cucumber essence took over. Each sip was a revelation. Why the Price? First and foremost, the setting. Masa is New York’s most expensive restaurant and so of course the cocktails – yes, made from high quality ingredients – followed suit. 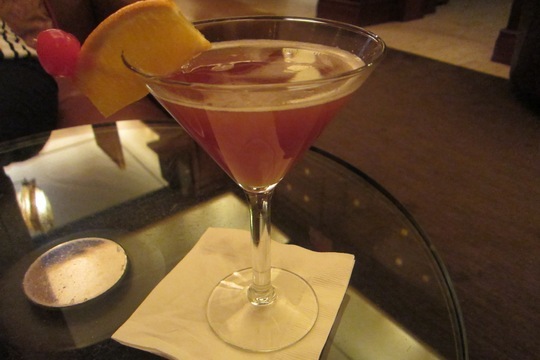 But also, the bartender mixologist (or whoever initially created the drinks) was a true artist. Is It Worth It? If you are a true cocktail lover wielding an expense account, then absolutely. Though we loved this drink more than words, the $26 price tag was still hard to stomach (while there diners came in, took a look at the menu and immediately fled to more reasonable pastures). We hate to say it, but part of us felt like this place was expensive just for the sake of being expensive. 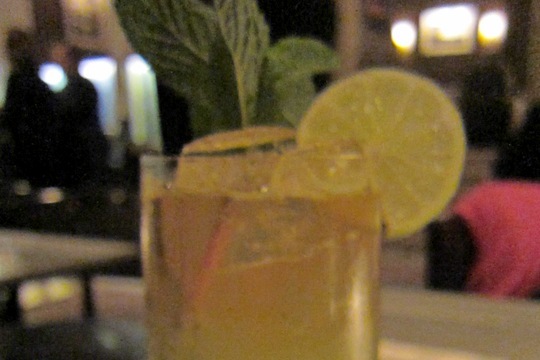 The Drink: A champagne topper gussies up an otherwise standard mojito made with mint, lime juice and rum. Why the Price? Name, name, name; location, location, location. That and the champagne, as most other cocktails on the menu were in the slightly more reasonable $16-20 range. Is It Worth It? In a word, no. Though possibly one of the most beautiful mojitos we’ve ever seen (and served in the most posh environs), it was fairly basic despite the champagne, which in our plebian opinion didn’t add that much. It didn’t rest well, meaning halfway through, it started tasting a little flat. Plus, we like to relax and pretend we’re somewhere tropical when enjoying this drink, which was hard to do when we had to put all our energy into channeling our imaginary alter ego: the Countess of Liechtenstein.